Before we start….hold onto your hats. I’m giving you fair warning: there’s a delicious onslaught of creativity ahead! Starting Sunday I have what feels like a gajillion videos queued up!! Next week is my traditional 24 tags of Christmas series. AND I have six crafty Bible themed crafts on my Bible journaling channel all week, too….I’ve got them teased up in the videos so you can click to go see both. THEN we’ll have a few semi-normal weeks; there are a few extra hops tossed in but it’s mostly 3 videos a week for a bit. THEN….for the first 12 days of December, I’ll have daily coloring videos, because I was a goof and bought too many stamps that I can’t wait to show you! I know it’ll be getting way close to Christmas to order those and wait for shipping and still get anything created. So I’m gonna put together a newsletter full of sneak peeks for those projects and links so you can order them up – perhaps on Black Friday or Cyber Monday to nab them on sale – in case you want to have them ready to stamp along with me in December. I know, I know, this is nuts, but I’m gonna call it my “Race2Christmas” series. And will hope not to repeat that series again! (my wallet hopes that, at least!) You can sign up for the newsletter in my sidebar, or at the bottom of my blog. I think. Lol. I’m writing this note late at night, forgive me! 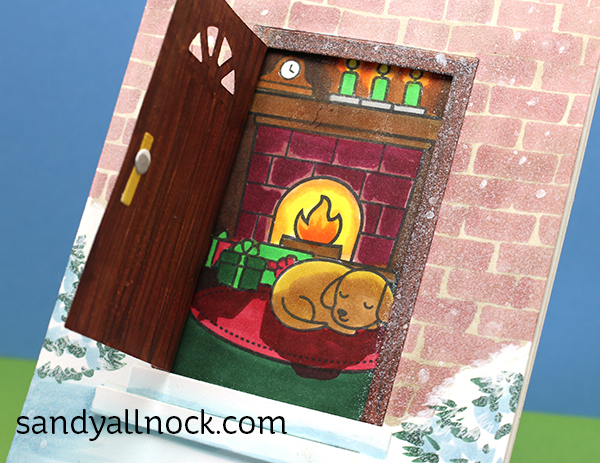 I’ve colored so many stamps and scenes with wood that as soon as I saw this door die from Lawn Fawn, I had to add it to my queue of video projects to share! (I’ll likely do some more on Instagram too, so keep eyes peeled through the season!) Most of what I’ve seen done with this have outer doors looking into a scene inside a house. But I did an inside door looking outside! 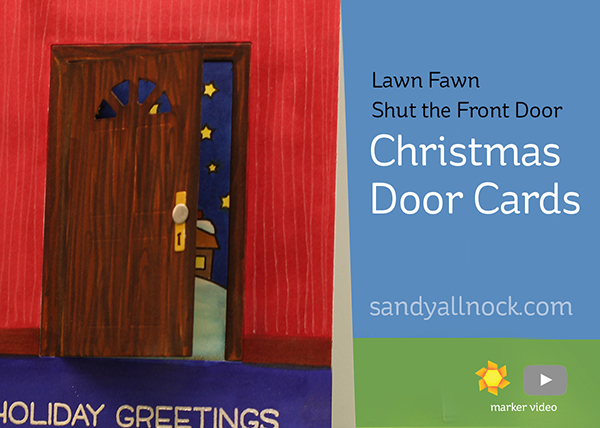 There’s so much room to customize the door’s surroundings. Make it look like your house! Watch the video below or click HERE to see it in HD on YouTube. Here’s the house colored in the video – with those little white Sharpie pen lines to make the wallpaper. The scene is so cute out the door, it doesn’t even need any crazy shading at all. What a great use of this die/stamp set. Super cute..
Love the open door cards. The kitty sleeping is the one I hope to attempt to make. You are one of the few creators that lots of posts makes me happy… no way I’d unsubscribe. Thank you for all the time you put into sharing you talent and witty personality with us. I can’t wait for a new video when I finish the current one. 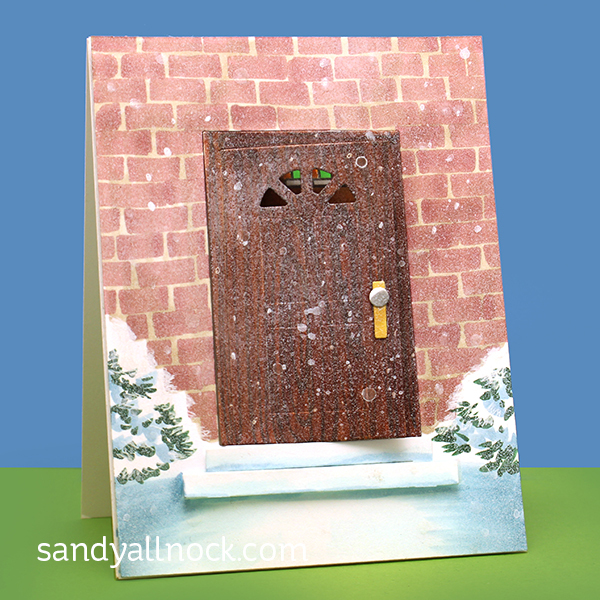 You’re the cardmaking Bob Ross with your relaxing tone and making it seem easy enough to pull off. My dogs even enjoy hearing your dogs during a stream video… they answer back. Anyway just wanted you to know you’re appreciated and to thank you. Who would complain about extra content?! They are crazy pants! Love the idea of indoors looking out. O darn, we’re going to get extra videos from Sandy (wink, wink)! Thanks for sharing such a darling and do-able card. 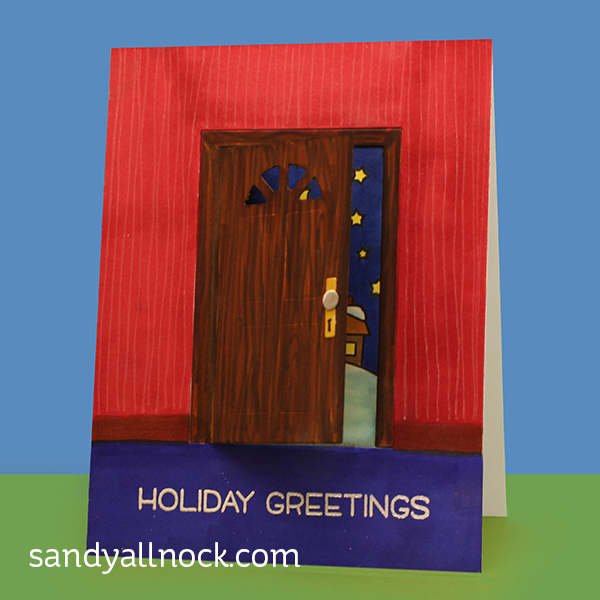 Enjoyed your video tutorial for this “door” card, Sandy. It’s such a fun interactive idea. Watching you create it has given me the courage to try it! Thanks. I love your card wiht the snow blizzard on top even more when you opened the door and it shows the cute pupy in front of the fire. The inside out card is also great, but the pupy card is my favorite! Thanks for your (always) fun and educational video! Yes, you are definitely crazy, Sandy, but in a good sort of way lol. It’s a good thing I managed to create plenty of Christmas cards throughout the year, or I wouldn’t have time to watch your videos in the next couple of weeks. I don’t know when you find time to eat and play with the dogs or anything else! Great work! Thanks for sharing your updates! 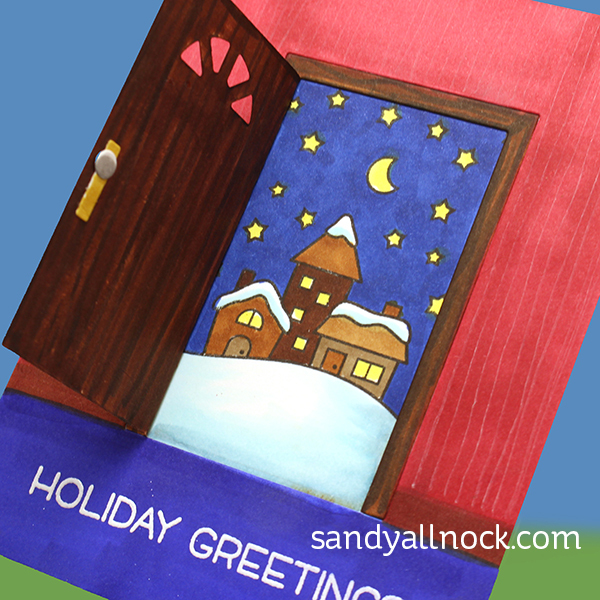 So creative Sandy – Thanks for sharing.